I have always been and always will be intrigued by books, movies and television shows that open up our minds to history and even more so towards what I call conspiratorial history. According to Ralph Epperson, author of “The Unseen Hand: An Introduction to the Conspiratorial View of History” – we make a deal with our conscience to accept different views of history. We believe in the catastrophic or accidental view of history. Or we choose the other view which is the conspiratorial view of history. The deal is that we have to decide how things truly are in the world and make decisions on what resonates with our conscience. In the catastrophic or accidental view of history, we are led to believe that historical events, such as wars and revolutions were the direct result of some sudden or surprising event. While the catastrophic view is accurate for weather, volcanoes and earthquakes, it does not always provide a realistic view of humanity and events influenced by man. Sadly, most of us have been taught the accidental view of history. This view is reinforced throughout our lives by the controlled mass media. As a result, when most discover the conspiratorial view of history, the immediate reaction is shock, disbelief and a refusal to accept something other than they’ve been taught to believe. The conspiratorial view of history shares a common thread with the biblical view of history. That is, there is a plan of good that is being carried out and that there are various evil elements that want to bring down that plan. The eventual result will be a corrupt plan lead by a corrupt self proclaimed messianic leader of a corrupt government. The New World Order has always been mentioned as the final outcome of a corrupt theocracy. There are many people who believe that the theocracy would be the best fit for everyone because it is a government that allegedly gets its power from God. The leader of the theocracy would then demonstrate why his position is one of divinity. He would have within his grasp, holy artifacts, signs and symbols that would be used as tools to convince the world of hid divine incarnation. The deception of theocracy is that while it is said to be the government directed by God it is most certainly a government that is ruled by the powers of black magic. This magic is the primary behavioral control tool of the Illuminati. It is used by an inner circle of elected apostles that are part of the global elite that control the world. The members of the inner circle remain in hiding as the shadow government, but they do not hide what they do. Black magic only works most deeply upon humanity, when it operates right out in the open. I recently was watching a television show that after 3 episodes was cancelled by ABC. 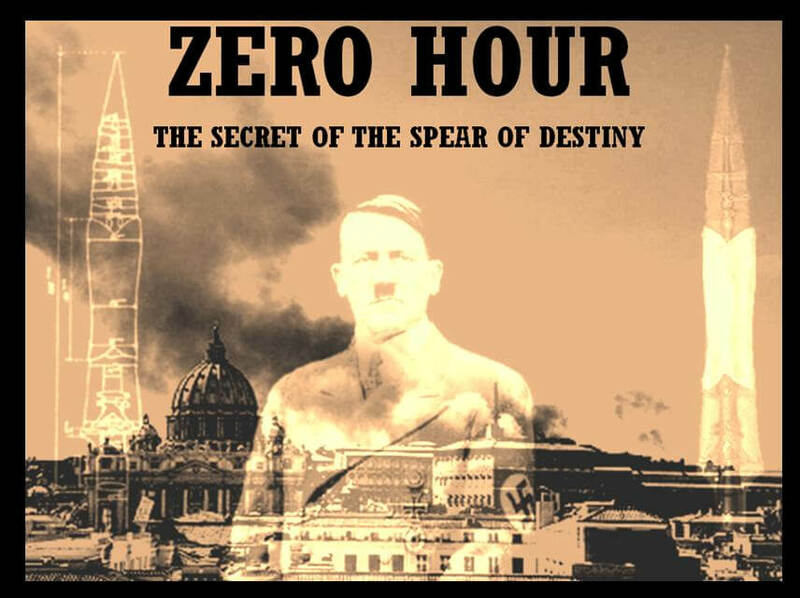 The television show was called ‘Zero Hour‘ and the network axed it after it showed poorly in the ratings. I felt that the decision to cancel the show may go a lot deeper than ratings. The program was slowly opening up a conversation about a secret society known as the Rosicrucians and how they have kept a secret about a project that the Nazi’s were involved in that would destroy not only mankind but God as well. The story deals with Hank Galliston, a magazine publisher that tries to debunk conspiracy theories. After his wife Laila buys a clock from a boardwalk vendor, she is abducted. What we find out is that the clock is tied to some Rosicrucian and Nazi conspiracy. The Nazis in this story apparently had an artifact that was very powerful. It was able to not only sustain eternal life but to destroy life as well. In response, the Church appointed twelve new “apostles” that assembled in 1938 to protect the war-torn world from doom. A clock was created for each. The apostles then scattered to hide from the Nazis. Now that there have only been three episodes, we may never know what the entire series was going to reveal. It did, however, allude to a few things. One was the powerful life and death artifact was in possession of the Rosicrucians and that the Nazis wanted it back. The month of March in the year 1938 was important and that the same month would play into some event in the present. In 2003, Cambridge University Press published a book titled, “The Holy Reich: Nazi Conceptions of Christianity, 1919-1945“. The book took on the idea that leading Nazis were of the opinion that Nazism was a restored and redemptive view of a new and vibrant Christianity. The author, Richard Steigmann-Gall, an assistant professor of history at Kent State University, demonstrates in his book that men considered to be among the most monstrous who ever lived, shared the genuine spirit of Christianity common to all adherents to that faith. He does so by citing unpublished letters and verbatim records giving the Nazi view of Christianity in the words of those who embraced it. The author contends that most of the leading Nazis saw in Christianity the supreme expression of Aryan ideology. The book demonstrates the total sincerity of the Nazi attitude toward Christianity. The Nazis sincerely believed they were devout Christians and that Nazism was a divinely inspired program to establish a master race based on the model of the Aryan Christ. Much of the so-called pagan revivalism of Nordic Gods, according to Steigmann-Gall, was brought about not by the majority, but a minority of “blood and soil” revivalists led by Erich Ludendorff. The “blood and soil” revivalists of Hitler’s day would be the equivalent of those who consider themselves earth worshipers and environmentalists. Two years after the Tannenberg League was founded, Hitler expelled Ludendorff from the Nazi party. In the version presented by many historians, the militant-mystical ideology of the Nazis has been mistakenly identified with Ludendorff’s anti-Christian program, but Steigmann-Gall shows that Nazism was a fundamentalist Christian revival in the heartland of Europe. Hitler was especially interested in religious artifacts that he wanted as possessions in order to purge any Jewish ties to Christianity. While Hollywood has told us that Hitler was especially interested in the Holy Grail and the Ark of the Covenant, the truth is that Hitler wanted to have in his possession the Sword of Destiny, or the lance of Longinus, the very lance that pierced the side of Jesus during the Crucifixion. The Lance of Longinus was a Christian artifact that became a cult object in the 11th Century when the Crusades brought forth the epidemic of relic-hunting. The Holy Lance’s power came from the idea that the blood of a God was on it. In John 19:34 we read that instead of the roman soldier breaking the legs of Jesus on the cross he pierced Jesus’ side with a spear, bringing a sudden flow of blood and water. The name of the Roman centurion Longinus occurs only in the apocryphal Acts of Pilate. It was first discovered at Antioch and Christian Monarchs believed that it had all sorts of wondrous powers. Many great conquerors possessed the Lance, From Constantine the Great, the Roman Emperor who had legalized Christianity. Theodosius, Alaric who sacked Rome, Theodoric who turned back Attila the Hun, Justinian, Charles Martel who had defeated the Muslims at the Battle of Poitiers, Charlemagne, Frederick Barbarossa and Frederick II, and others as well. Now these great conquers also paid the consequences for having this artifact in their possession. Charlemagne had kept the spear with him throughout 47 victorious battles and had only died when he accidentally dropped it. Barbarossa, like Charlemagne, died within minutes of dropping it as he crossed a stream. Hitler had an obsession with the artifact. The high strangeness in the television program ‘Zero Hour’ deals with how the conspiracy theory publisher stumbles on to a series of maps hidden in clocks which lead to several locations around the world. In the first episode, Hank goes to the arctic and finds a Nazi submarine and inside it is a German soldier that is his exact doppelganger. His other investigators hook up with a known Nazi memorabilia collector who attempts to tell the curiosity seekers that the doppelgänger that looks like their boss was, in reality, a Nazi officer that, while seeking the true Aryan bloodline in the Middle East, found a girl who was able to talk to the dead. They seek out this girl in India who has now aged and when they do find her she warns that the world is will end soon and that there is a secret that both the Nazis and the Rosicrucian’s know that if revealed would start the eschaton rolling. They also find out that Albert Einstein had a hand in keeping the secret and that he used it in order to create the atomic bomb. The show plods along and it is obvious that it was hitting rock bottom from the beginning, the only thing is that if I were to speculate about the possible plot the show would have revealed the secrets of “bloodlines”, “secret chiefs”, “Nazi experimentation” and the great secrets of the Rosicrucian secret society. Now that the show has been cancelled we may never know the significance of the month of March and 1938. However, I can use my own knowledge to reveal that German troops entered Austria on March 11, 1938. The first thing Hitler did upon the annexation of Austria in 1938 was to walk into the Hofburg and take the Lance of Longinus into his hands, nearly 30 years after he first set eyes on it. Hitler seized the sword in the name of the Third Reich. After having declared Austria to be a part of the Reich, Hitler had it loaded on to an armored SS train and taken to Nuremberg on October 13. There it remained in St. Catherine’s Church for the next 6 years. In his hands it was the most potent artifact of evil. He used the sword as a divining tool. It is also no secret that, in a more paranormal way of looking at his power structure, Hitler was guided by what are called “secret chiefs.” These secret chiefs were allegedly cosmic advisers whose mission was to give instructions on how to prepare the world for the new Golden Dawn. The chiefs saw the population as locusts to be exterminated in order to maintain global sustainability. In the television show ‘Zero Hour’, the last episode was hinting at the locusts and how they are part of the pestilence that will be released in the end times by Apollyon or Apollo the destroyer. Hitler had made a pact with the secret chiefs and they had turned on him. It is in the nature of the homunculus to turn on its creator. He lost possession of the Spear of Destiny and all of the other oracles that gave him power over these alien gods. On April 30, 1945, the same day Hitler committed suicide, the American army invaded Nuremberg and took possession of the Spear of Destiny. It was removed to a safer, protective underground vault where Lt. Walter William Horn of the United States Army took possession of it in the name of the US government at 2:10 PM on April 30, 1945. Soviet Archives that were once kept hidden from us now reveal that when the Russian soldiers captured Hitler’s bunker, Hitler died from a gunshot wound to the head by his own hand at 3:30 P.M. 80 minutes after the United States took possession of the Spear. In the months that followed, America unleashed the most destructive force ever known to man: the atomic bomb. While in possession of the Spear of Destiny, America became the undisputed ruler of the world. We can only speculate that it was then that the demonic horde of “secret chiefs” changed their course and abandoned Hitler for greater possibilities in the United States. They eventually wound up in New Mexico where the first atom bombs were tested. It was as if the super chiefs were animated by the radiation release and were drawn to it. In the meantime, it is rumored that General George S. Patton, who was also a known Rosicrucian, demanded that a duplicate spear be made and that the real one would be taken and held for safe keeping. He knew the significance of the spear and felt that the United States army deserved possession of it. Few people are aware that Hitler not only wanted to round up Jews, homosexuals and gypsies, but he also wanted to weed out the Rosicrucians and the Freemasons. Of the first 7000 people imprisoned by Hitler 2000 of them were members of the secret orders that were commissioned to protect the secrets of the Ark of the Covenant, the Holy Grail and the Lance of Longinus. In fact, Heinnrich Himmler once reported that Rosicrucians were hired by the British secret service in order to seek out and protect religious artifacts. It was believed by Hitler that the “Secret Destiny of the World” was known by the Rosicrucian order. President Truman, a 33 degree Mason, ended World War II by dropping the atomic bomb. The bomb was the work of Rosicrucian Albert Einstein, who believed that this destructive power was first reported to be used anciently by the people of the Euphrates River valley, the very place that Hitler sent his scientists to find the pure Aryan race. The same place spoken of in the television show ‘Zero Hour’. The mystery of the clocks, the dates and times and the month of March all point to some esoteric predictive programming of a “power play” that will once again open the dialogue for a dark psychological war that will trigger the beginning of the great cull that was first attempted during the Holocaust. In the year 2013 we will be seeing the changes that will indicate a greater magical threat where the powers that are taken from the ancients will be evident in our present. We must understand that occult numerological references are usually hidden in plain sight. I need to once again tell you that 2013 when sequenced 20+13 equals the number 33. 33, of course, is a number that is packed with occult power and a fond number of synchromystics because it is the highest degree in Freemasonry. On March 22nd, 1980, the erection and dedication of the Georgia Guidestones took place. That was 33 years ago. These guidestones tell us of the world’s secret destiny and how to maintain sustainable life – which includes a drastic reduction in human life. Are we preparing for a possible war that will reduce the population substantially? The Catholic Church has now lost its Pope and there are many who are concerned about the next Pope being the last Pope as predicted in the Malachy prophecy. The pope will be known as Peter the Roman, however the namesake may be a hidden reference and it will not be obvious to the people that Peter the Roman is sitting on the throne as that Vicar of Christ. The name chosen by the reigning Pope will more than likely be Pope Pius XIII. Pope Pius X saw a vision of a successor of his, who had the same name, fleeing Rome over the dead bodies of members of the clergy. According to my interpretation of Sacred Scripture, the next Pope, i.e. Peter the Roman, (i.e. the pope after Pope Benedict XVI) will flee Vatican City and Rome during World War 3; many members of the clergy will be killed during that time period. When he flees, the city will be half in ruins, due to the civil disorder, violence, and rioting that occurs during the war. He will escape Rome, but he will soon be captured and blinded, and he will die in a prison in Iraq with no one to rescue him. Pope Pius the XII of course was the last Pope that was reigning at the time of the World War II culling and holocaust. Pope Pius XII was the Secretary of State before his Of the Vatican elevation in 1939. This coincidentally is the same position as Cardinal Tarcisio Pietro Evasio Bertone. Many people believe that he is the front runner for the new Pope. A man who many believe has been compromised by the same secret societies and occult secret chiefs that were in power during the times of Hitler. Many Catholics are now claiming that a multinational power elite and occult hierarchy is operating behind supernatural and global political machinations to once again establish the same power grab as was accomplished in the times of Hitler. The claims are that false Catholic infiltrators who understand that, as the Roman Catholic Church represents one-sixth of the world’s population and over half of all Christians, is a vital resource for controlling future global elements in matters of church and state and the fulfillment of a diabolical plan called “Alta Vendita,” which assumes control of the papacy and helps the false prophet deceive the world’s faithful into worshiping the Antichrist. The overall theme in ‘Zero Hour’ is that time was literally running out and, as the plot would edge nearer to the mysterious date in March, the irony is that the series was canceled and time ran out on March 1st, 2013. Not enough time to tell the story of secret societies and how they are controlling the outcome of the well-planned apocalypse.